I've been thinking a lot about Christo since hearing his talk in Stowe last Thursday. Before 2005, he and his wife/artistic partner Jeanne-Claude were, for me, those oddballs who had wrapped the Reichstag in fabric. Then came “The Gates,” the artists’ installation in February 2005 of 7,503 orange metal gates, each hung with a rectangle of billowing orange fabric, along the winding paths of Central Park in New York City. I walked beneath a portion of them. It was an experience I’ll never forget, and I’ve puzzled over its impact ever since. Perhaps because I’d lived in Japan and witnessed the reverence shown at Shinto shrine torii – those vermillion-colored gates that the New York installation seemed to echo – it felt as if passing under each gate was at once a solemn and celebratory event: a processional. Which, in turn, felt like a celebration of every person ahead of and behind me, in a city where anonymity rules. It was the gift of recognition: Walk here and be honored. Everyone has a different interpretation of Christo and Jeanne-Claude’s works (she died in 2009), as Alex Aldrich, executive director of the Vermont Arts Council, pointed out while introducing Christo to the sold-out audience at Spruce Peak Performing Arts Center. 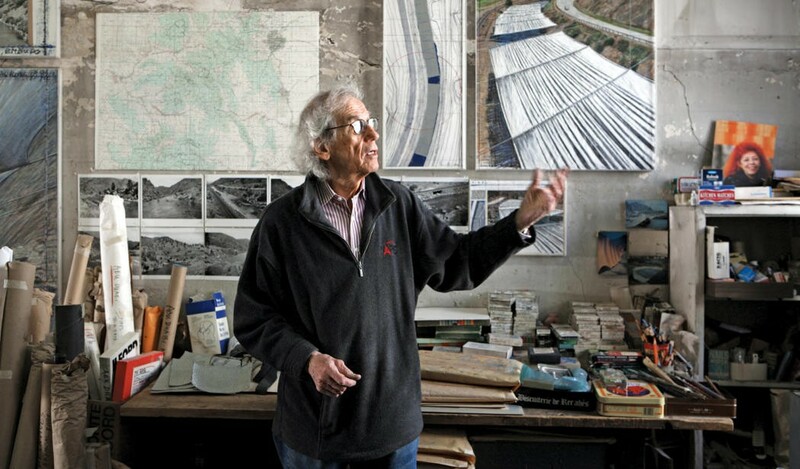 Christo’s visit was courtesy of Vermont Town Hall – a collaboration begun a year ago of a handful of local individuals and Spruce Peak’s foundation to bring “intriguing” speakers to the public – and Inntopia, a software company. Aldrich had experienced a Christo and Jeanne-Claude installation, too: “Running Fence” (1976), the white fabric fence that meandered for 24.5 miles through two southern California counties before plunging into the ocean. Perhaps that’s why his introduction was so heartfelt and personal. The artists have had stunningly beautiful photographs taken of all their works, in all kinds of light, but there is no comparison between viewing images of their installations and moving through them. Christo used his talk and slideshow to promote the artists’ two works-in-progress: “Over the River,” which may one day (if legal appeals by anti-OTR activists are overturned) stretch ridiculous amounts of sheer, silvery fabric across multiple sections of the Arkansas River in Colorado, creating a roof for the whitewater rafters; and “The Mastaba,” envisioned as a kind of flat-topped pyramid made from 410,000 oil barrels that Christo wants to erect permanently in the desert of Abu Dhabi. The latter, if ever erected, would be the largest sculpture in the world. These projects were conceived in 1992 and 1977, respectively. Much of the artist’s talk was about the permitting process for each work. Mindblowingly tedious, and requiring superhuman patience, the process is part of the work of art for Christo. Here’s a taste of their trials: For “Over the River,” the couple prepared a 2,000-page report for the federal Bureau of Land Management, which owns the river and land around it. That cost more than $1 million. Then the feds required them to produce an Environmental Impact Study costing an additional $2.5 million. To date, they’ve spent $14 million of their own money on a work of art that doesn’t even exist. The money issue stumped the audience, as it has many observers. All their works, according to the artist, are funded solely from the sale of Christo’s drawings of them, which he produces in numbers that must make ordinary artists feel lazy. Some of the sketches and collages he made for “The Gates” sold for $600,000 apiece. Nevertheless, one wonders about the actual numbers, including how much ends in profit for the artist. An audience member in Stowe asked where the massive amounts of materials for these projects go when they’re dismantled. In one case, Christo answered, the material used to wrap a million square feet of vertical coastline in Australia was the same soil-protecting industrial fabric used by farmers there, so it all went to use locally after the 1969 installation came down. Otherwise, though, Christo seemed uninterested in specific attention to the environment. His next project, one guesses, is unlikely to raise awareness of climate change. But, really, who cares? Certainly not Christo. Asked why he creates what he does, the 79-year-old artist answered for himself and Jeanne-Claude with that age-old justification of artists: “All these projects we do for ourselves. We have an unstoppable urge.” And thank goodness for that.